The New York Giants are re-signing Cody Latimer to a one-year contract. Latimer dealt with a mid-season hamstring pull last year and wound up playing in just six games for New York. He totaled 190 receiving yards on 11 receptions, and will serve as depth behind Golden Tate and Sterling Shepard. Latimer will compete with Corey Coleman for snaps in three-wide sets. New York Giants wide receiver Cody Latimer was placed on injured reserve with a hamstring injury on Wednesday. Latimer just played for the Giants in their Thursday night matchup against the Arizona Cardinals, but his season is now likely over after being placed on injured reserve. Cody Latimer hauled in three of his four targets Thursday against the Eagles for 39 yards. Latimer finished fifth in targets, third WR. The Giants are struggling to maintain two fantasy-relevant WRs in Odell Beckham Jr. and Sterling Shepard, so Latimer is not currently on the fantasy radar. 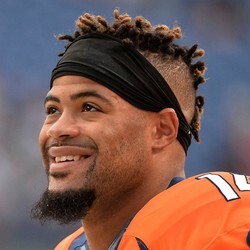 Outside of his one kick return for 15 yards, Cody Latimer was absent from the box score for Sunday's Week 1 loss to the Jacksonville Jaguars. He was not targeted on the day. 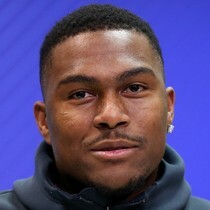 Latimer won the number three wide receiver job in training camp but will have to compete with fellow wide receivers Odell Beckham Jr., Sterling Shepherd, tight end Evan Engram, and running back Saquon Barkley for touches. He should only be started in the deepest of leagues as an emergency option. Cody Latimer has won the Giants' third wide receiver job. Latimer won't be fantasy relevant in the role, given the presence of receivers Odell Beckham Jr. and Sterling Shepard, as well as tight end Evan Engram and running back Saquon Barkley, who should command a lot of targets himself. Still, he could be someone to monitor should there be an injury to one of the players ahead of him.